Videos from Mexico! 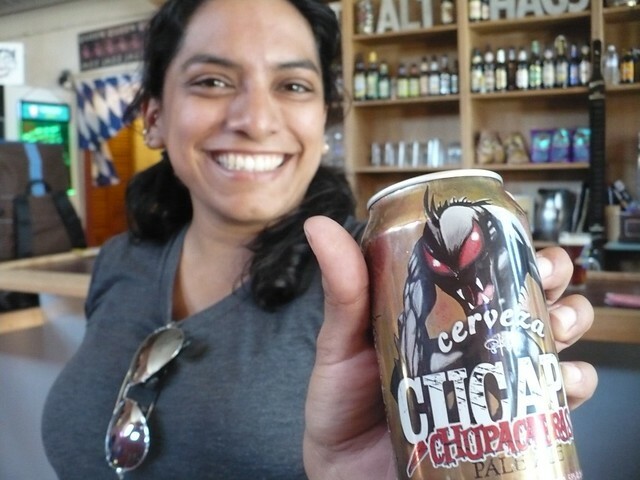 Sent to us by friend of the blog, Alejandro. What happens when your bicycle gets stolen from the mall because they have no bike parking? This mall in Guadalajara finds out! 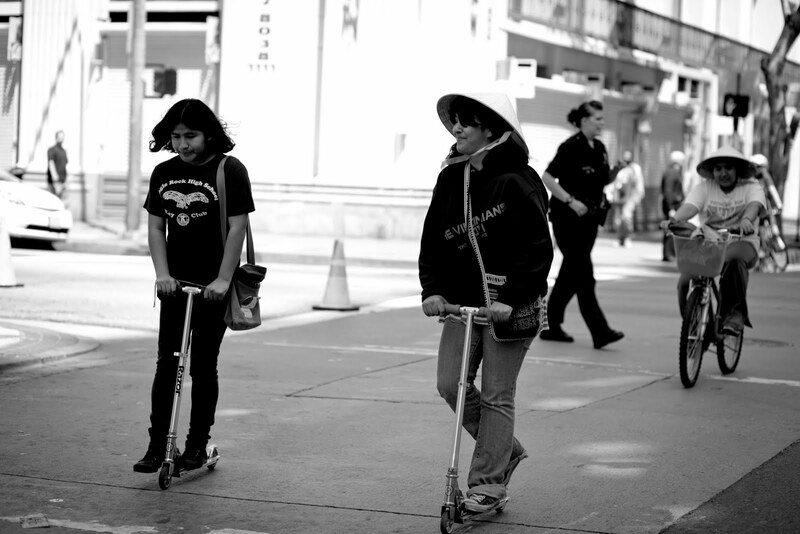 Our next video is from Mexico City (I think), from the blog Colectivo Camino, Haz Ciudad. The problem faced by the pedestrians in this film is one you can find in just about any city in Mexico- no sidewalks, no protection from cars and people forced to take their lives into their own hands just to get home from work. Imagine the guts it takes, and the lengths you have to be pushed to to get out and paint your own sidewalk! I remember driving through small towns all over Mexico and how all of them had hand painted stop signs put up wherever the locals felt they were needed. I also remember playing dodge car like the people in this video every morning between my house and the University and it was not pleasant. 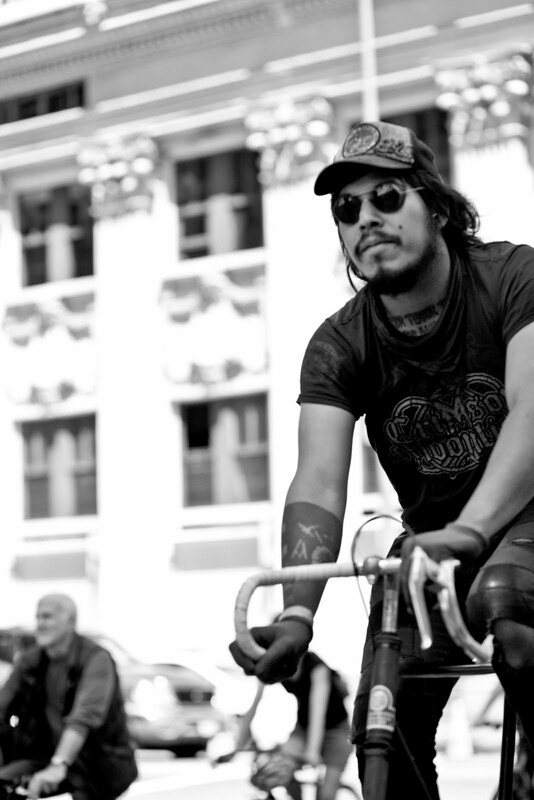 We complain here in the US about our lack of bicycle lanes, but I think that the Mexicans have us beat, not just for the lack of infrastructure but for the heart and soul the people who want to change the status quo are putting into their cause. We could all learn from this! Why Is the Sky Blue? Why Do Bikes Stay Up? A little more video from the wonderful world of friends who share! So there it is. We don't all know what we think we know and now we know. Let's see what people can come up with now! roaming the streets as cyborgs with ponies. here's a video someone sent in via chat to the blog. looks like it's a year old, but wow. 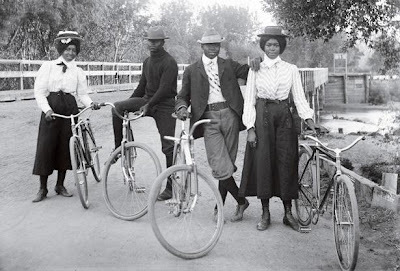 combines a lot of great things the blog likes to celebrate such as sending kids off on a bike (gonna have to just trust a little bit), and images of native americans riding vintage tour de france bicycles. so awesome. 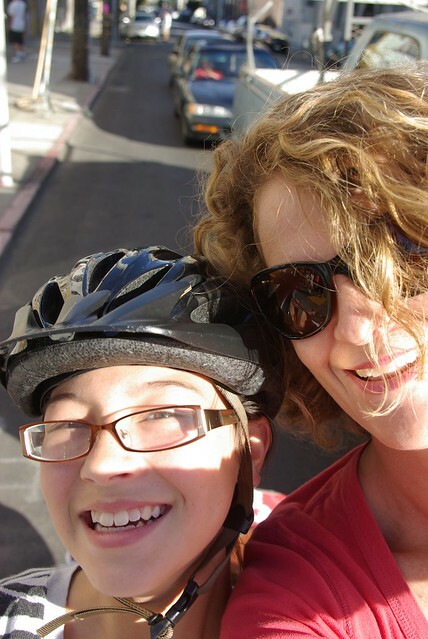 teri, a painter who grew up in los angeles, where she felt like the only biker in LA, now resides in berkeley and talks about her daughter, her grandfather and her painting. thanks for sending this in, and remember we love submissions! definitely need to check out more of streetsblog's videos if they made more like these. awesome. 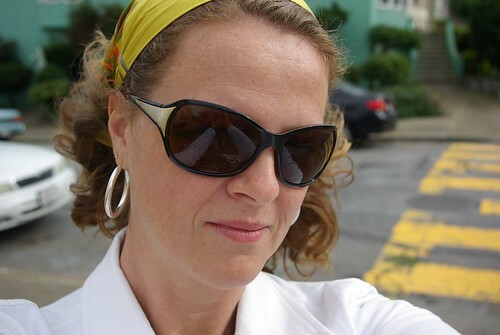 Street Portraits - Terri from charlotte buchen on Vimeo. oh hai. happy monday everyone!! found via red bike and green's facebook page. wow, a lot of things coming down the pipeline! 4/23: saturday. lots of earth day things going on. 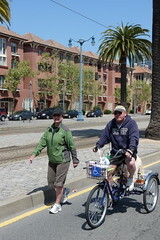 check out civic center and golden gate park as some things to experience earth day (everyday). 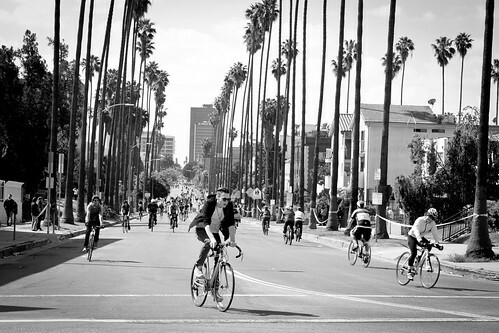 4/24: on easter sunday join a lifecycle training ride! you don't have to be doing the actual ride to join and there are a lot of different levels at which you can participate! they start early enough for you to meet your family or meet with your fellow urban orphaned friends. go here to find out more. want to go north? ride to alpine dam!!! have a grrrrrrrrrreat weekend everyone!! in my never ending quest of getting to 999 unread items in my google reader (joking...), i came across a video today i thought i bookmarked. guess i didn't because i couldn't find it again. grrrrrz. in trying to recreate the search later at home to no avail, i came across these videos instead. 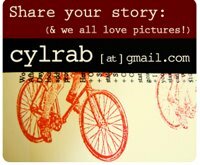 first is about bicycle ambulances in malawi and the second is about bikes not bombs sending bikes from boston to africa. In Malawi there is a shortage of ambulances and many roads are in a bad condition. As a consequence, many pregnant women and their children die because they do not arrive in time at the hospital. Dutch trader Peter Meyer came up with a solution: the bicycle ambulance. 3 years ago he started Sakaramenta, which now employs 14 people. The Dutchman and his team sell over 60 bikes per month to hospitals and NGOs. Dutch bicycle ambulances saves lives in Malawi - Episode 13 from Africa Interactive on Vimeo. In Africa, a bicycle can make all the difference. Riding a bike is four times faster than walking, the only choice for millions of Africans. People with bikes get to schools, markets, farms and health care in one-fourth the time, improving their lives and economic futures. 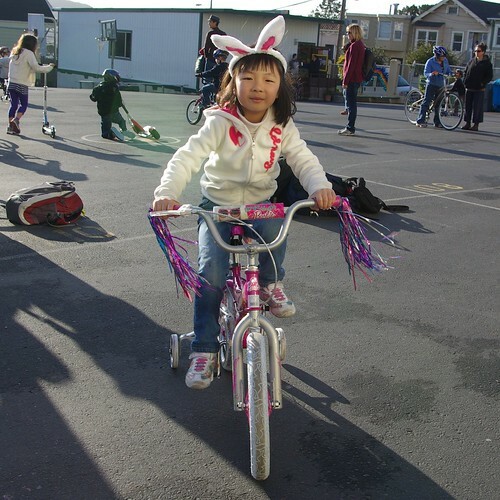 The VBP program supplies bikes, spare parts, tools and training in basic bike maintenance. 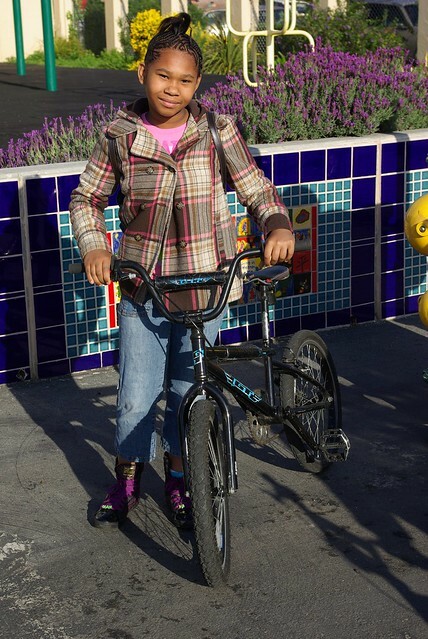 The program empowers whole communities by including women and girls in bicycle education. 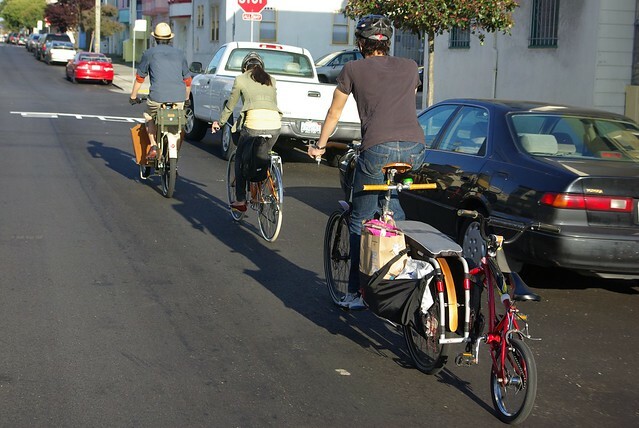 These components work together to nurture the use of bikes. Improved mobility is a key to reducing poverty. In Africa, a bicycle can take a person from poverty to prosperity. Made in 2006 as a short companion to the film Ayamye*. Co-directed & co-produced by Tricia Todd, edited by Austin Meredith. 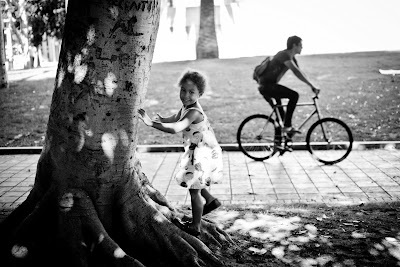 Village Bicycle Project from Eric Matthies on Vimeo. am not giving up on the initial search of the video i saw earlier today, but until then, please let us know what you think of those videos. 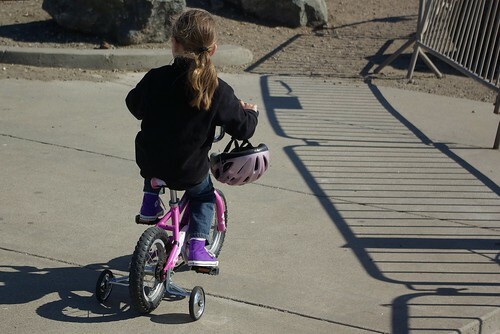 One of the things you have to teach your kids when you are teaching them how to ride a bicycle is how to get where they are going. 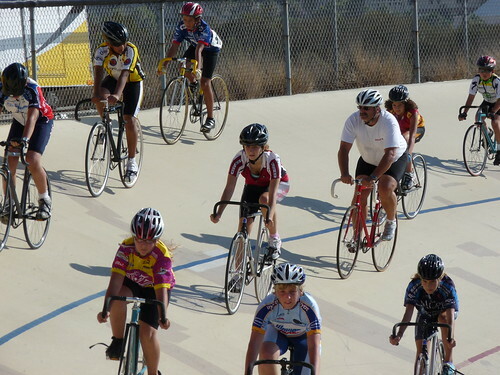 It is the part that frequently gets overlooked after the training wheels come off. There are many reasons for this, but I suspect that a lot of it has to do with fear of the unknown. 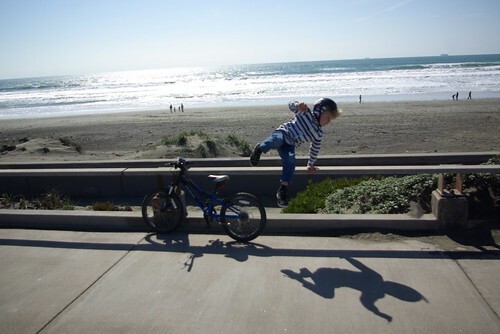 What will your kids do when it comes time to ride somewhere other than to the end of the cul-de-sac and back? Cameron is sixteen and old enough to get anywhere on his own. If he can't figure out how to get there, he is old enough to get lost and work it out for himself. Úna is used to following in the pack. Other than a few places she goes to at least once a week, she is used to just following whoever leads. She is skilled enough to ride almost any place in the City- her ability to glide through even the craziest situations with total ease is amazing! Her mental map is not very detailed, though. 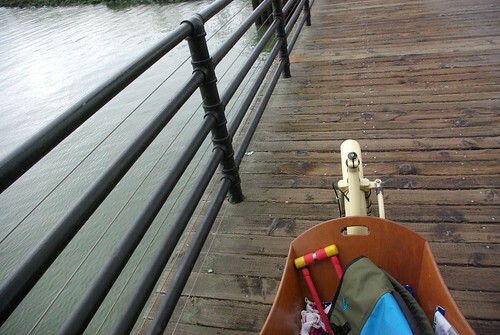 We have started to let Úna lead when we ride places. If she tells me she does not know how to get somewhere we have been before, I now put her up front and have her figure it out as we go. She knows where we are going better than she thinks she does, really all she needs is a push to take the lead. 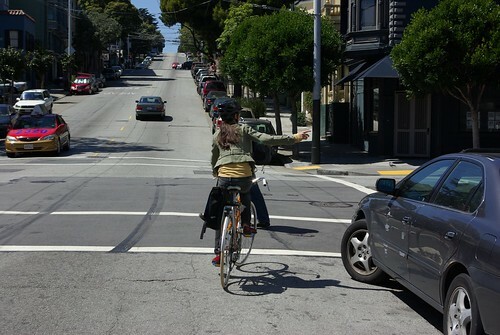 a Sunday Streets with no cars and nothing but open views of the ocean. 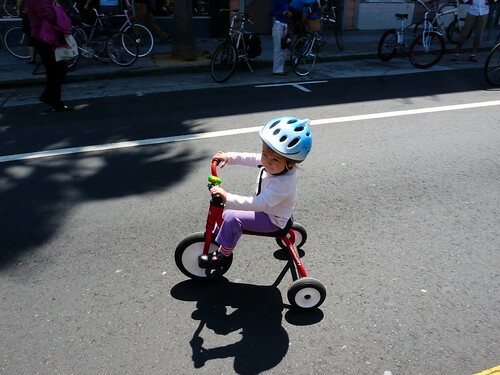 And no helmet which feels like total freedom to her. It won't be much longer before she is really out in the world on her own. As more and more activities crowd her time, she will have more places to get to. Without me to take her. They grow up quick! You gotta make sure they are ready for it! 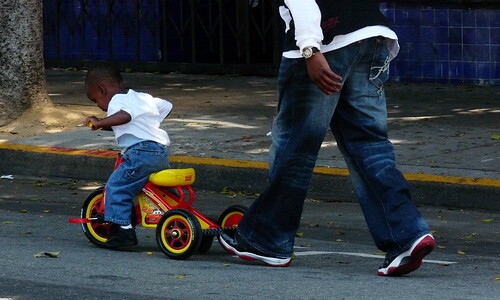 How do you get your kids ready for a street of their own? One of many reasons I love my City. We Are Coming Out Of The Woodwork! 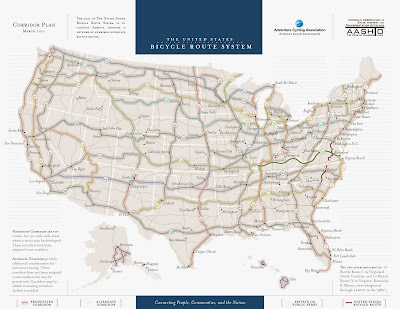 The world of daily bicycling in North America is evolving rapidly. 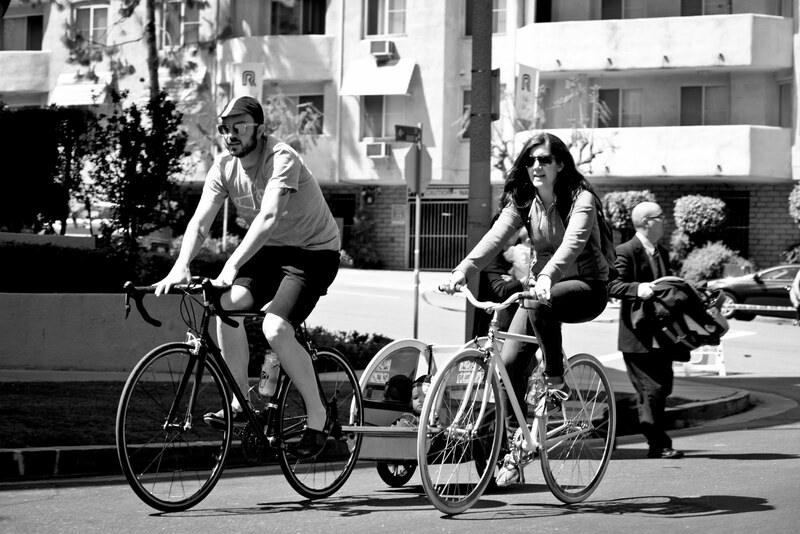 Not only are the options for city bicycles and more utilitarian platforms being explored, more and more of them are being used and seen on the streets! Yep. That's a hill and we are going up it on cargo bikes. It does happen. 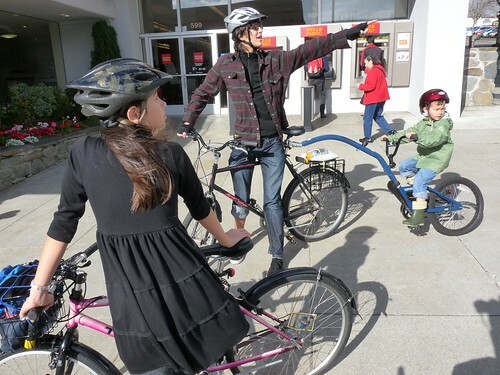 On our way home from a family outing to the Cherry Blossom Festival in Japantown, we ran into this lovely woman and her family. I was so happy to have a second family doing the same thing as us. It was really nice to ride next to people who didn't think we are superheroes because they know it is just regular old life. I wish this picture showed all of the riders queued up behind us at the light. 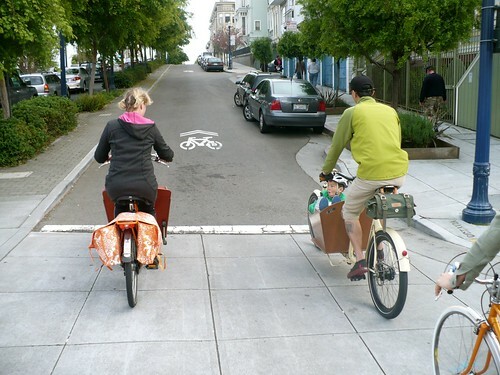 Cargo bikes, families, young people on their way out with friends, teenagers.... just the people who live in the City. As I am writing this at the end of a very long day, I forget their names, but I will not forget how lovely it was to ride together across a couple of neighborhoods and chat about how much our lives have changed with the coming of our bicycles (although there was some discussion of how much the women of the story looked forward to getting back on their motorcycles, soon!). 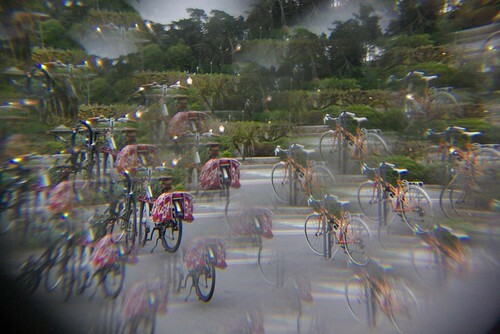 I can honestly say that may favorite thing about discovering my life on my bicycle has been watching the evolution around me. 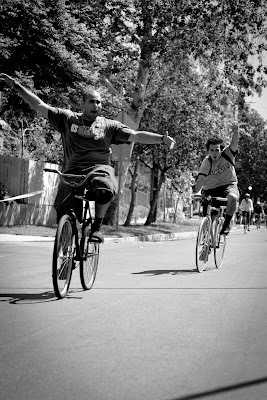 Everyday, I meet a new person who has come to find a better way to live through their bicycle and seeing their joy and, quite frankly, their emancipation never gets old! if you missed this 2nd ciclavia, next one will be sunday, July 10th :) yay! are you coming? bad babysitter behind the bar!! 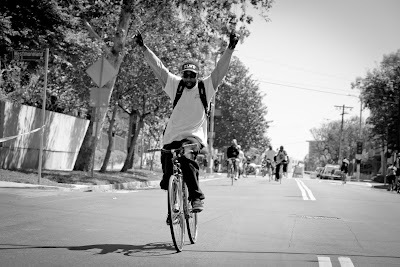 hey guys, stay tuned for our upcoming series featuring some SF riders doing their first ever AIDS LifeCycle ride. in the meantime, go on and support one of the featured riders tonight (4/13)!! bad babysitters behind the bar! All tips benefitting the team!! Go nuts. good luck and can't wait to hear how bad these babysitters are! You were so confident in your all navy blue wool, vintage inspired riding kit. Your helmet was so snug over you curly dark hair. Your IPod earbuds and wrap arounds fit so perfectly into the ensemble. The only thing amiss in your profile was the 15 pound bicycle chain you were carrying, although you do get points for wearing it stylishly around your terribly athletic waist. I first saw you as you were approaching the red light that was shining for you. It was a very convenient red light for me, as it allowed my light to be green thus enabling my entrance into the intersection to make my left turn. Imagine my surprise when, after making sure that the oncoming car, who also had a green light, was far enough away to allow my turn there you were! You and your brifters and your Chris King bottom bracket* and your coordinated SPD's, right there where I was supposed to be turning. I stopped, I looked at you as you continued to drift in front of me, I put up my hands in the international sign for "Dude! What the f*ck? Really?" Your response? "You have your signal on, there is room for both of us!". As the reality of how much room I had to make my turn was certainly a point of debate (I hold that when someone on a bicycle is in a particular space that it is not wise to try to insert my car into said particular space), it was of equal interest that the, formerly, oncoming car was now waiting his turn to enter the intersection and had the same hands up communication that I had employed. There is an argument that could be made that I could display "Righteous Indignation" at this point, but honestly, you Sir, were just to damn funny. Your bewilderment that I might find it unacceptable to run you over while you stormed my position was very amusing. While I may find the entrance into an utterly unoccupied intersection by a cyclist at a red light acceptable, it seems to me that doing so when the intersection is occupied by a moving car weighing 2701 pounds is a Darwinian Act. And thus we come to the next odd part of this encounter. When I was finally able to clear the intersection, not because you had stopped but because you had drifted far enough along to allow me movement, I was pleasantly surprised to see you in my rear view mirror. You were standing in your saddle, pumping those legs for all it was worth to catch up to me. I lowered my window in heightened expectation of what you may have to say to me when you would inevitably catch me at the next intersection. You did not disappoint, not in the least. You removed your ear buds, which was a polite thing to do but would have held more power had you removed your mirrored sunglasses, too, and proceeded to tell me about all the room you had back there, enough room for us to share. Sure, you admit, you ran the light, but.... You assured me you were not trying to be confrontational, that you only wished to inform me. My response? "You f*cked up, dude. Eat it and learn. Have a good ride!" It was hard to get the words out, as intelligent and considered as they were. I was just laughing too hard, and no, I was not laughing with you. My passenger, a fellow cyclist, sat in her seat saying "What the hell was that? Did he think he was right? Was he actually trying to explain that away?" Mr. Bianchi, should you read this, please understand that I have no ill will toward you. You seemed a perfectly decent person and I am sure your mother raised you well. It is simply this, Sir- crap like that is what makes people in cars angry at people on bicycles. It is behavior that you have complete control of and is not caused by poor infrastructure or a lack of awareness by the driving public. Entering intersections with moving cars in them when it is not your turn is stupid, dangerous and just really bad manners. If you do choose to take this action again, please don't try to explain it away. It makes us all look silly, selfish and self absorbed. 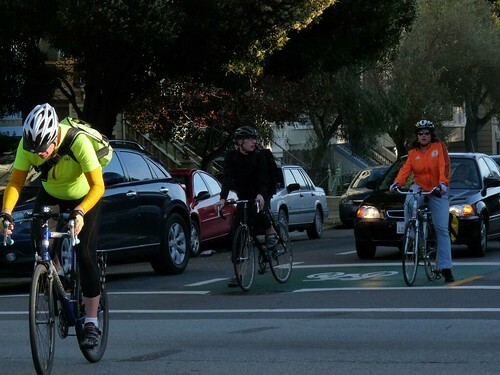 Just apologize and keep moving keeping in mind that the pissed off driver you leave behind you will most likely take out their frustration on the next cyclist they see. 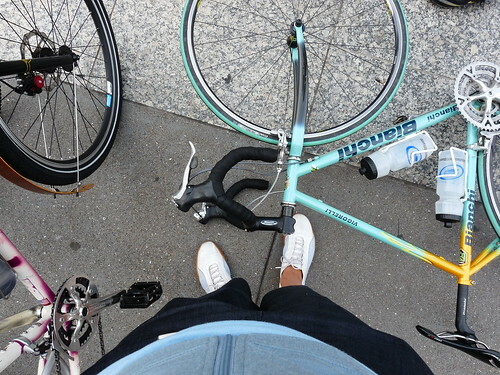 Have a great ride, Mr. Bianchi! *OK, I have one of those, too so I will give you a slide on that one. can get behind this article. 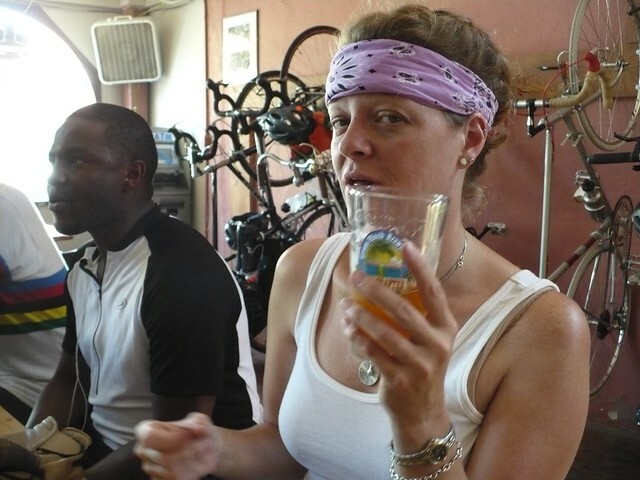 We already knew beer was good for you, and not just after a long ride. I am pretty sure Meli and Caryl would agree, as well, but I don't have pictures of them drinking beer. How did that happen? RE: Market Street's New Bike Boxes: Use them!! 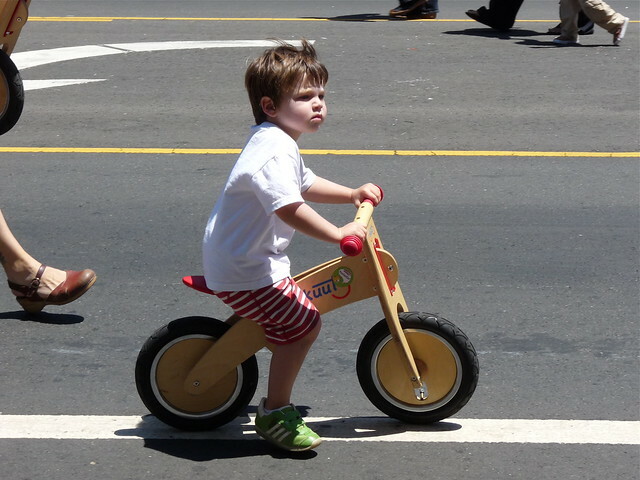 I, like you, ride Market Street daily to get to work. This has been rather well documented on the blog. Some of these bike boxes are more useful than others, but one in particular is amazing and very very much needed: the box at the intersection of Van Ness going eastbound. I've talked about the perils of crossing that intersection before. What I have noticed lately is that NO ONE (except yours truly) that I've seen communting around me is actually using the box. There is a bike box on the wiggle at Scott and Oak that people use, so what is it about the new Market Street bike boxes that have people staying out of the box? It's arguably more necessary to use the eastbound Van Ness bike box than any other one on Market Street. 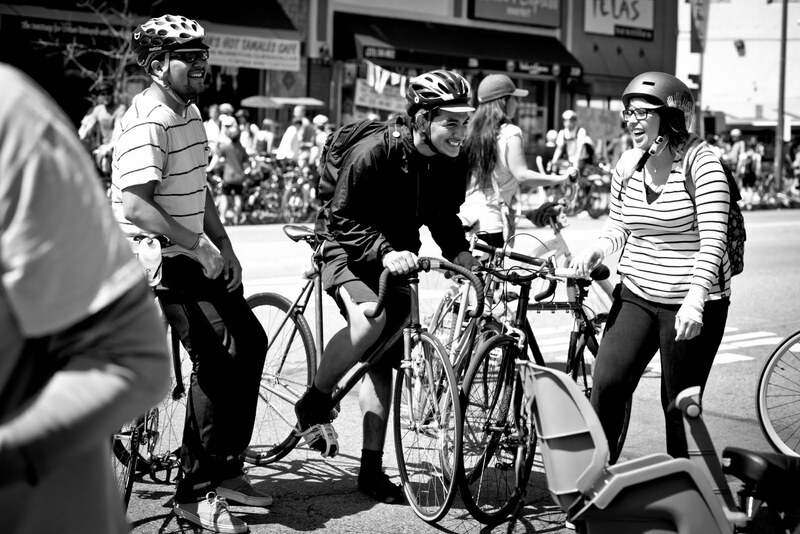 Just in case you don't know what to do with the awesomeness which is our little bikey bright green space on Market Street and Van Ness, here's two StreetFilms videos describing how to use a bike box. In the immortal words of biggie smalls, "if you don't know, now ya know." 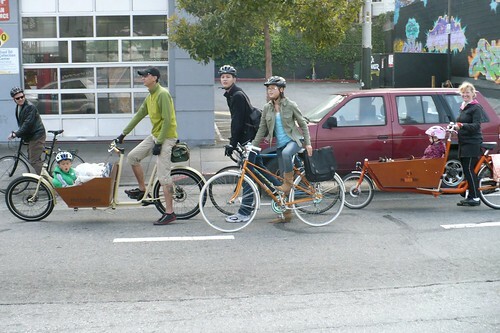 So fellow Market Street bike commuters: use the box! It's ours to use!! I let the boys take the cargo on the weekends. That is what husbands and teenaged sons are for. An enlightened, 21st century view, I know. 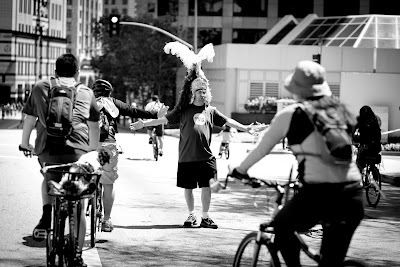 Every first Friday of the month you get the chance to come be silly on your bicycle with a bunch of people that want to be silly right along with you! I wrote this in the comments of a post back in November 2009.
down goes the foot. damn! OK. Your turn! We haven't had any baiku's in a long time! Remember 5-7-5 is the pattern and bikes are the theme. GO! 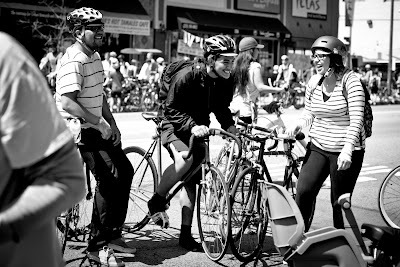 San Francisco will be jumping during our 2nd Sunday Streets event of the year! 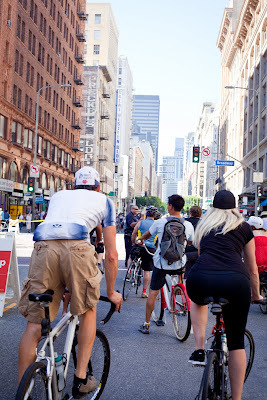 6 continuous miles of beautiful, wonderful, open CAR FREE space!!! Come see what your world could look like, and just how much noise you live with everyday (you really notice when it is gone!) 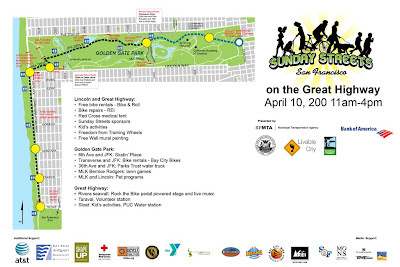 The weather will be great and there will be plenty of room to ride, hula, skate, sunbathe, lie in the middle of the road, throw frisbees, ... Click on the map for a larger version. Los Angeles will be doing the same thing for their second year! 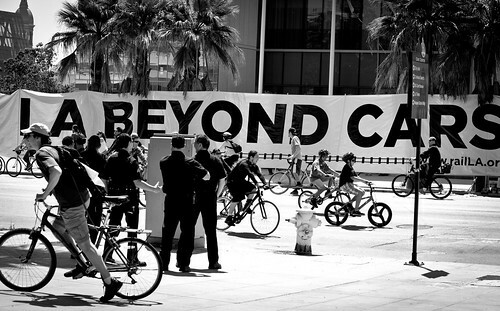 Get out there Angelinos! 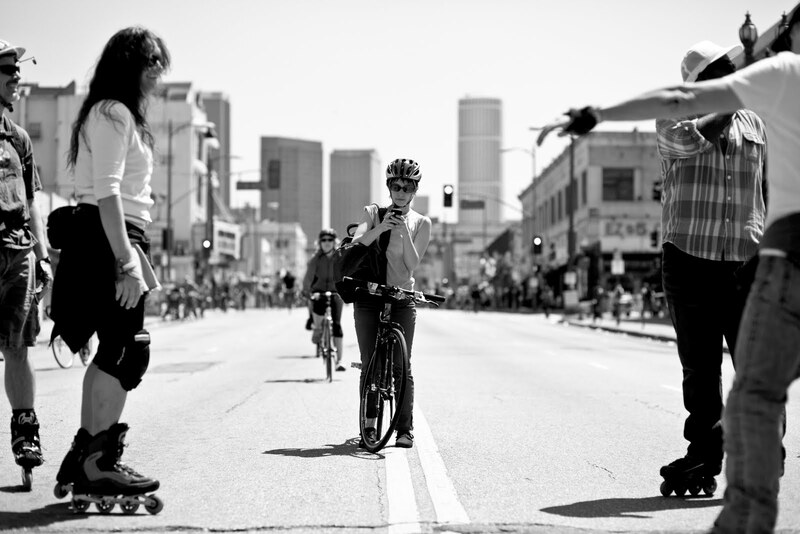 Go see what LA was like before it was turned into what it is now. It is amazing how quiet and tranquil the city can be when you give it a chance. Now, imagine what it would be like if this was the map for a really big car free party for all! It has been SUPER windy around here lately. My hair has become an impediment. It actually makes it impossible to see sometimes. At these times, I go back to the 50's and pull out the scarves. They are great, with a couple of hair clips to keep it in place. Should you be a helmet wearer, it would disguise helmet hair as well! hello LA friends! 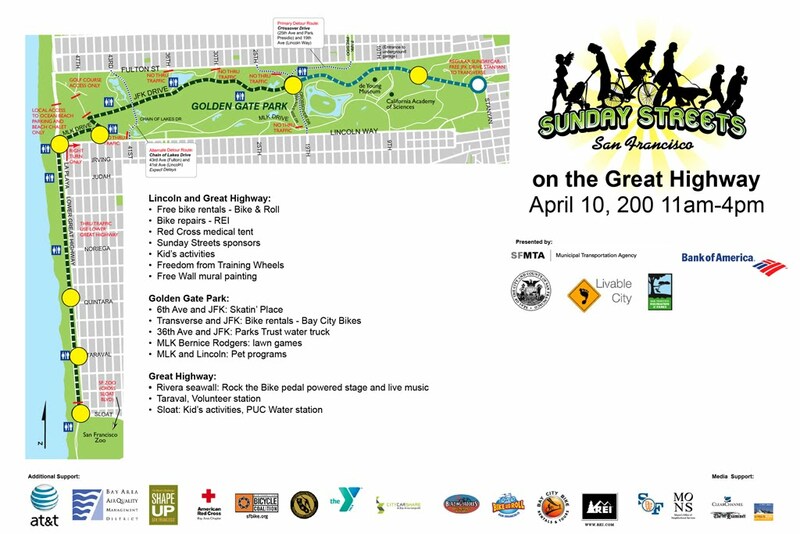 this sunday, from 10am-3pm 4.10.2011 (yes! 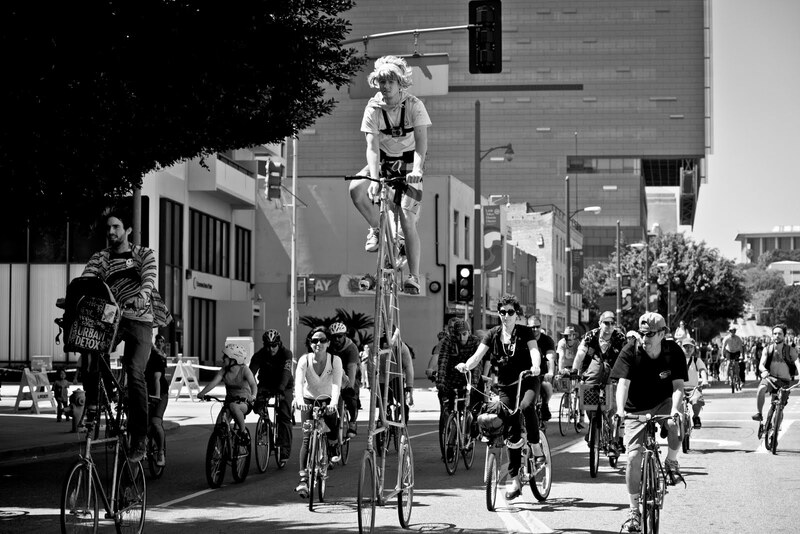 :) tomorrow) is the second CicLAvia. more photos from last year!! :) :) hope to see all you pretty people there! At our second party stop for Bike Party this month, I decided to try to shoot the kids running their BMX bikes up the climbing walls. This is what I got. 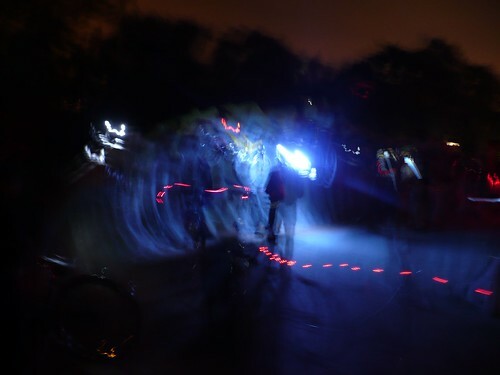 Sometimes Bike Party feels just like this looks. Next ride- May 6th! 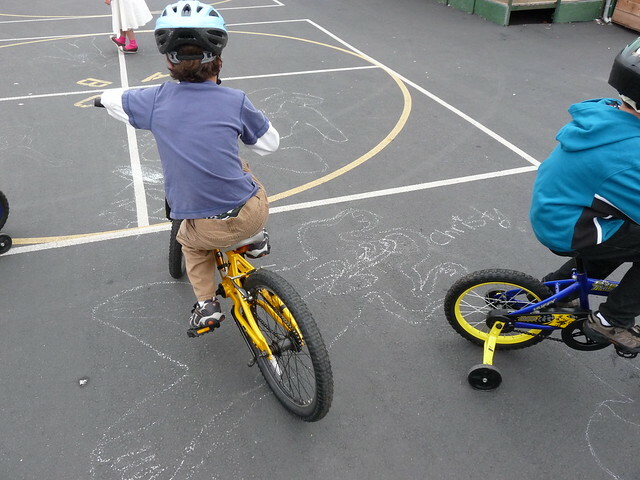 Today was Bike To School Day in San Francisco. 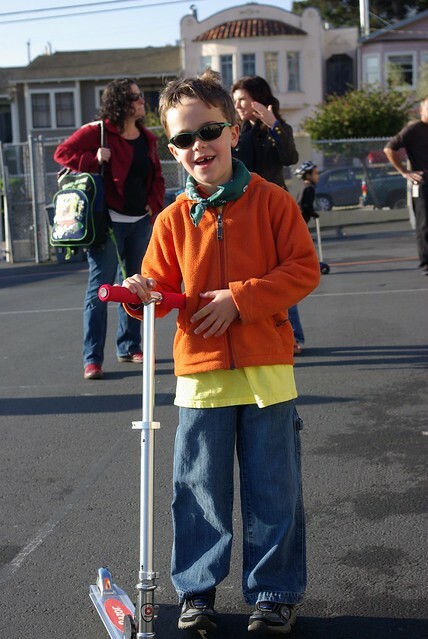 Like Walk To School Day, kids and families are encouraged to try a new way to get to school. It grows a little bit every year, and at Declan's school 25% of the kids arrived by bicycle or scooter. 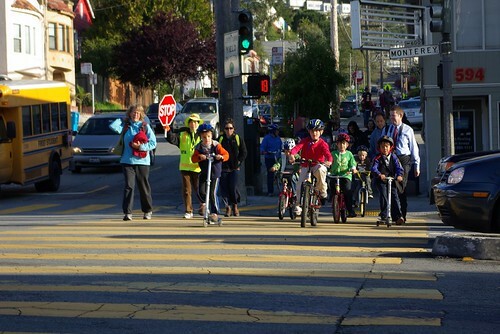 Most days it is closer to 3% and to be honest, many people drove their kids to the spots where groups were gathering to ride in to school together (the groups are called Bike Buses). Cameron and Úna do not really get the occasion. 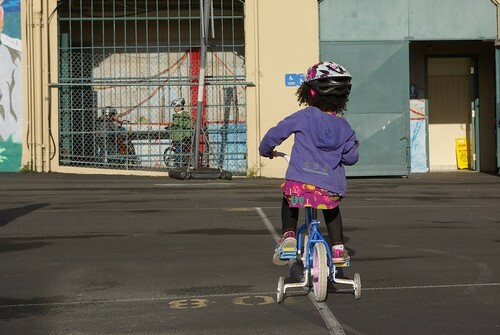 Like many of those who ride a bicycle to work everyday do not get involved in Bike To Work Day, the kids ride their bicycles all over the place already. 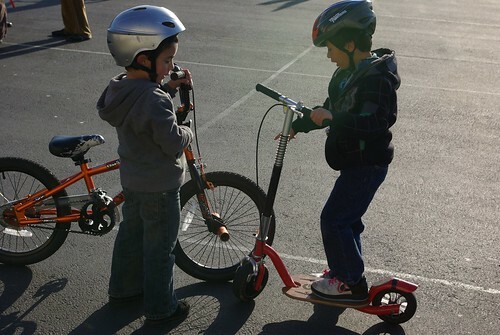 Declan had to be convinced it would be fun to ride an extra four blocks so he could meet up with his friends to ride to school. Once he got there, he was thrilled to ride with everyone else, but he still doesn't get it. Nevertheless, this is an opportunity to challenge parents to start thinking about other ways to do things. Maybe this is the excuse to start encouraging their kids to be more independent. 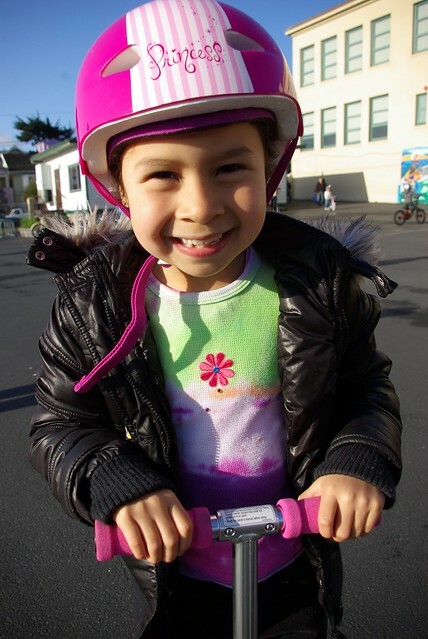 Perhaps Bike To School Day is an opportunity for the kids to take pride in their bicycles and that feeling of freedom that comes with them. For some, it was that first taste of what it is like to be a grown up. For us, a few moments to see it ourselves. For some it was Scooter To School Day. I am good with that. They have two wheels, too. So, while every day in the O'Chan home is Bike To Blank Day, we welcome all of the new comers. We hope to see them all in the lane in the years to come.